Back, Butter, Breast, Free. It’s easy to understand as they are all styles of swimming. I remember this saying from the beginner days of taking swim classes including Tickle-T-Touch. But little did I know there was so much more to the sport. Swimming is one of those sports that I have always had issues with understanding its terminology. I find myself googling what exactly my coach has me doing for the day because I have no clue what a tombstone kick is. So I have an idea of, but then he fools me once again! If you are like me, you would love and appreciate a swimming study guide of what every term means. Which is why I asked my coach and Master swim instructor Tony Rich to put together a list of the top confusing swimming terms that you may have in your TrainingPeaks or master’s swim class workout. However, being the swim wizard he is, he sent a boatload of workout terms and man I had no idea there were this many! Some are easy and you probably know them from the workouts you have done or watched in the Olympics, but there may be some that surprise you. So to help you out in your next class, remember to come back to this reference guide and before you know it, you will be able to read a set and not have to ask what it means! If you are interested in having Tony as a coach of help you with your swimming, visit Eventhorizon.tv. 1. Ascend (abr. Asc.). The reverse of Descend. Each consecutive swim gets slower. Your swim time increases = you get slower. 2. Base Interval (abr. Base or B). This term is used for freestyle repetitions of 100 yards unless otherwise specified. It is the interval at which you can swim a sustained aerobic effort for a prolonged distance 1000-2000 yards. It is not necessarily the fastest interval you can make, but one which challenges you while allowing you to remain in control of your swims. Typically, if you are doing a set of 10 x 100s, you would be getting approximately 10 seconds rest. 3. Best Average. Holding the best time possible for the number of repeats on the given interval. 4. Build or Build Up (abr. BU). Often confused with Descend, Build has a distinct meaning. Each swim starts slow and ends fast. You build your speed throughout the swim. 5. Build Down (abr. BD). The reverse of BU. Each swim starts fast and ends slow. Gradual decrease in speed. 6. Cruise Interval. A field test to help a swimmer determine their aerobic training pace. Swim 10 x 100 freestyle with 10 seconds rest in between. Take note of the total time it takes to complete all 10 including the time for the rests. Convert that time to seconds and divide by 10. This is your cruise interval for 100 yards/meters. 7. Cycle. A stroke cycle includes two arm strokes, one with the right and one with the left. 8. Descend (abr. Desc). Each consecutive swim gets faster. Your swim time decreases = you get faster. 9. Drill (abr. Dr). A general term for doing technique specific work during a set. There are many different types of drills and often the coach will explain exactly what he or she wants you to do. After swimming for a while, you will develop a repertoire of drills for each stroke that you may be called upon to use when an imprecise “drill a 50 ” is offered. 11. Fast. 85-95% perceived effort. One step below ‘sprint.’ You should push off the wall swimming fast, but unlike sprint, you can hold close to this speed for the specified distance. 12. Individual Medley (abr. IM). Swim, usually 100, 200, 300 or 400 yards long, swimming equal distances of all four strokes in one interval, in the following order: butterfly, backstroke breaststroke, freestyle. i.e., a 200 IM would be 50 fly, 50 back, 50 breast, 50 free. 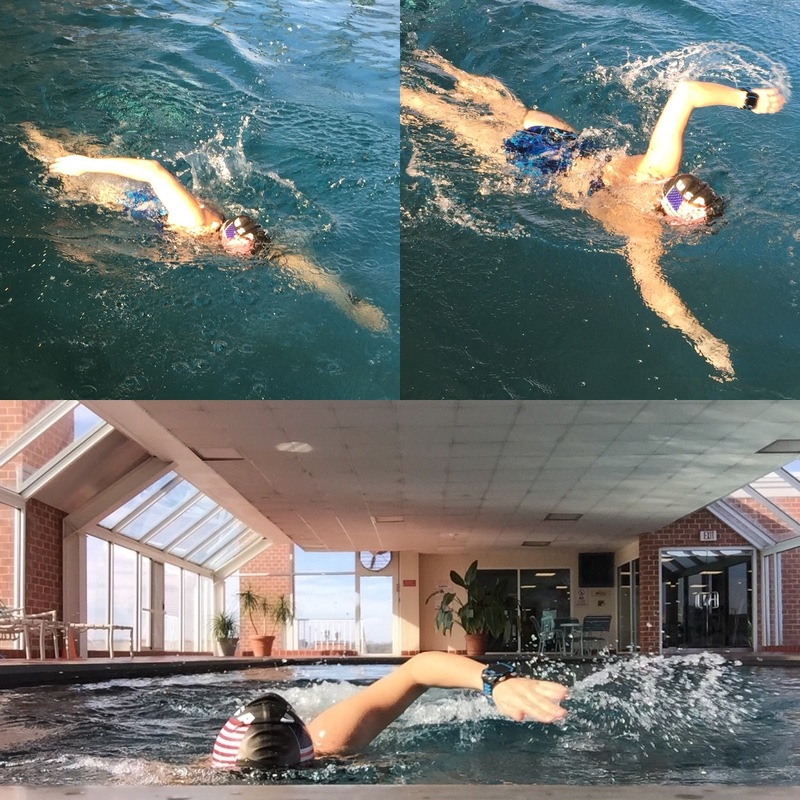 Triathlete’s IM allows the swimmer to replace butterfly with freestyle. 13. IM Transitions (abr. IM Trans). Swims focusing on 2 back-to-back strokes in the IM. i.e., 3 x 50 IM trans would mean #1 – 25 fly/25 back, #2 – 25 back/25 breast, #3- 25 breast/25 free. 14. IM Order (abr. IMO). 4 x 75 IMO means #1 – fly, #2 – back, #3 – breast, #4 – free. Reverse IM Order (abr. Rev IMO). 4 x 75 Rev IMO means #1 – free, #2 – breast, #3 – back, #4 – fly. 15. Interval. Time to complete a swim of a certain distance. Rest time is included in the interval and varies in duration depending on the specific aims of the set. i.e., 4 x 200 on 3:00. This means that you have 3 minutes to complete 200 yards before you begin the next one. You push off to begin swim #2 at exactly 3:00, etc. Nearly all sets are done on either an interval or rest interval. 16. Lap. One length of the course. Sometimes may also mean down and back (2 lengths) of the course. 17. Length. The length of the pool. 18. Long Course. A 50-meter pool. (i.e., LCM). 19. Negative Split. Swim the second half of the distance faster than the first half. 20. Pulling. An exercise that uses just your arms. This usually involves putting a pull buoy between your legs and sometimes using paddles on your hands which adds resistance. Your feet and legs should remain immobile. 21. Rest Interval (abr. RI). Rest time after a swim of a certain distance. i.e., 4 x 200 on 10s RI. This means that after you complete the first 200, you immediately look at the pace clock and begin the second 200 exactly 10 seconds later. If you touch the wall at 2:53, you push off for the next swim at 3:03. Nearly all sets are done on either an interval or rest interval. 22. Send Off. The interval or time on which you begin each repeat (swim) of the set. For example, if you swim 4 X 100 on 1:30, the Send-off is 1:30. If you swim a 1:22 for the 100, you will have 8 seconds rest before you need to leave on the next send-off. 23. S.K.I.P.S. Acronym for swim, kick, IM, pull, swim. Usually consecutively. 24. S.K.I.D.S. Acronym for swim, kick, IM, drill, swim. Usually consecutively. 25. Sculling (abr. SCULL). The back-and-forth motion of the hands and forearms, usually with a light kick, which propels the person forward. Done on the front but can also be done on the back. 26. Short Course. A 25-yard or 25-meter pool (i.e., SCY or SCM). 27. Stroke. One arm stroke. 28. Strokes per Length (SPL). The number of strokes per length of the pool. 29. Stroke Length (SL). Also called distance per stroke (DPS), it refers to the average distance a swimmer travels during each stroke cycle. 30. Stroke Rate (SR). Refers to the swimmer’s turnover. 31. Tombstone Kick. A drill that makes kicking with a kickboard more challenging. Instead of holding your kickboard parallel on the waterline as you normally would, hold it perpendicular to the water. Half of the kickboard should be under the water and half should stick straight out of the water creating a ‘tombstone’ appearance. 32. T Time. A field test to help a swimmer determine their aerobic training pace. Swim 1000 yards of freestyle as fast as you can, then divide your time by 10. This is your T-time interval and provides a basis for pacing in workouts and baseline for improvement. 33. x. Means “Times.” i.e. 3 x 100 means do a 100 yard/meter interval 3 times.